IN SEARCH OF THE ULTIMATE MINT. IS IT 11.0? In a recent copy of the Comics Buyer’s Guide (issue #1463), a chart was showcased revealing how many copies of the coveted "10.0 Mint" grade were awarded by Comics Guaranty, LLC (or better known as "CGC") since their inception. Surprisingly, only ten books [with an issue date prior to 1990] were given this cherished grade. Since 1990, a mere 112 comics (of the 100,000 books so far graded by CGC) had received a perfect 10.0. Perhaps this is why we have seen such inane prices for a "10.0 Mint" comic book. In the past months, high graded CGC books have been fetching prices ranging anywhere from two to 25 times normal guide prices. The prized "10.0 Mint" grade capturing the highest honors as featured in the CGC: Hall of Shame. It has almost gotten to the point where the encased comic book itself has become secondary to the madness of attaining "perfection." The question now is, what’s more important - the comic or the grade? And more importantly, if 10.0 is the highest grade offered by the CGC, does this mean that "ten" equals "perfection?" 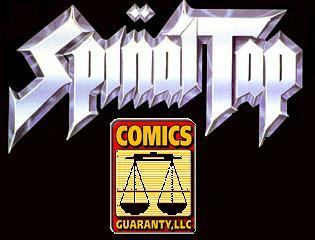 Recently, Terrence (webmaster of THIRD MILLENNIUM entertainment) ran into Nigel Tufnel of the group, Spinal Tap, who was happy to show off his collection and discuss the insanity of the heavily sought after "10.0 Mint" grade. NIGEL (very excited): Don't touch it! Don't touch it! No one...no one...no! Don't touch it. TERRENCE (pulls back) : Well uh I wasn't...uh I wasn't gonna touch it...I was just pointing at. NIGEL: Well don't point, even. TERRENCE: Can I look at it? NIGEL: No. No you've seen enough of that one. TERRENCE: Don't look at it. NIGEL (pointing to CGC labels): ...the numbers all go to eleven. Look...right across the board. TERRENCE: Does that mean it's...BETTER? Is it any MINT-Y-ER? NIGEL: ...all the way up. You have a 10.0 comic ..where can you go from there? Where? TERRENCE: Put it up to eleven. NIGEL: Eleven. Exactly. One better. TERRENCE: Why don't you just make 10.0 the best and make 10.0 be the top... number...and make that a little better? NIGEL (confused): ...these go to eleven. that'll never be read anyhow? With my idea ... are you paying attention mate? With my idea, the fans get a perfect "11.0 Mint"
holder and not have to pay wacky CGC prices." Wow. Is it us or is this guy onto something? Thanks Nigel for allowing us your insight into the crazy world of finding perfection in a product that is meant to be read and enjoyed - not hoarded and prostituted for its inflated value.